Namuwite: Mineral information, data and localities. May contain considerable Cu; measured Zn:Cu ratios in samples from different localities: 2.5:1.5; 2.3:1.7; 3.3:0.8. 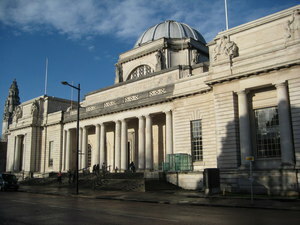 An acronym for the NAtional MUseum of Wales. Compare the closely related (but Cu-free) Unnamed (Basic Zinc Sulphate Hydrate). 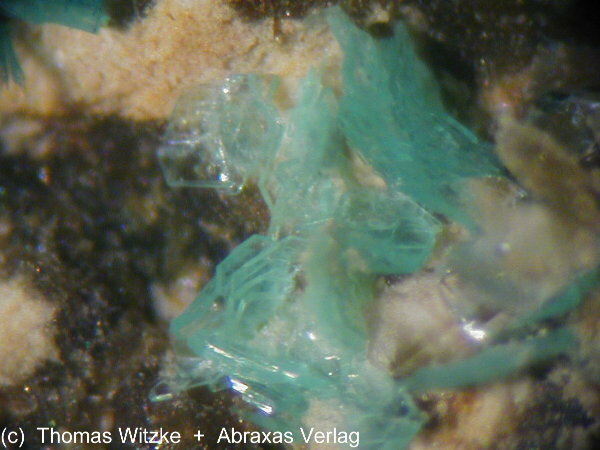 Note: Well-developed, tabular "Namuwite" crystals from some slag localities in the Harz mountains, Germany, are in fact Unnamed (Gordaite-related Ca-Zn Sulphate Chloride Hydrate) (U. Kolitsch, unpubl. data). May appear visually similar to schulenbergite and minohlite. Crystal form did not allow for accurate measure of refractive index of extraordinary ray. Gypsum 4 photos of Namuwite associated with Gypsum on mindat.org. Linarite 3 photos of Namuwite associated with Linarite on mindat.org. Schulenbergite 2 photos of Namuwite associated with Schulenbergite on mindat.org. Serpierite 2 photos of Namuwite associated with Serpierite on mindat.org. Hemimorphite 2 photos of Namuwite associated with Hemimorphite on mindat.org. Langite 2 photos of Namuwite associated with Langite on mindat.org. Smithsonite 2 photos of Namuwite associated with Smithsonite on mindat.org. Cuprite 1 photo of Namuwite associated with Cuprite on mindat.org. Posnjakite 1 photo of Namuwite associated with Posnjakite on mindat.org. Orthoserpierite 1 photo of Namuwite associated with Orthoserpierite on mindat.org. 25.5.4 Ktenasite Zn(Cu,Zn)4(SO4)2(OH)6 · 6H2O Mon. 25.5.10 Glaucocerinite (Zn1-xAlx)(OH)2(SO4)x/2 · nH2O Hex. 25.5.15 Zincmelanterite (Zn,Cu,Fe)SO4 · 7H2O Mon. Bevins, R. E., Turgoose, S. & Williams, P. A. 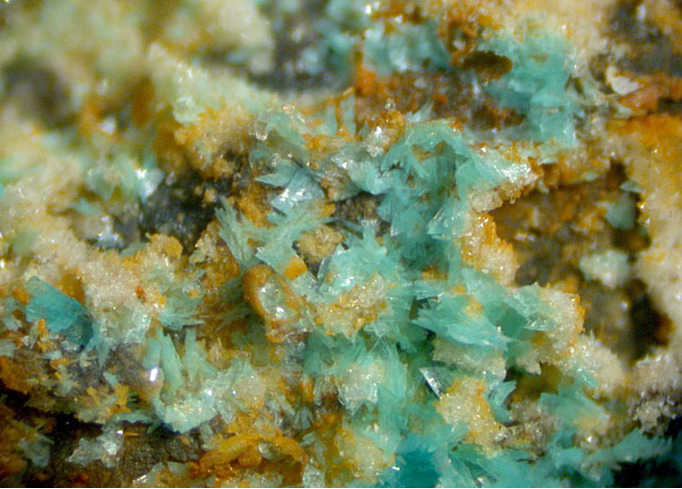 (1982): Namuwite, (Zn,Cu)4SO4(OH)6·4H2O, a new mineral from Wales. Mineral. Mag., 46, 51-54. American Mineralogist (1983): 68: 281. Lee Groat (1996) The crystal structure of namuwite, a mineral with Zn in tetrahedral and octahedral coordination, and its relationship to the synthetic basic zinc sulfates. American Mineralogist: 81: 238-243. Elliott, P. (2010). Crystal chemistry of cadmium oxysalt and associated minerals from Broken Hill, New South Wales (Doctoral dissertation). Schnorrer, G. & Poeverlein, R. (2008): Schwaz-Brixlegger Fundstellen. 6. Die Minerale des Gratlspitz bei Brixlegg in Tirol. Aufschluss 59, 7-28. RÜSENBERG, K. A. & PAULIŠ, P. (1996): Umbildungen und Neubildungen in den Schlackehalden der Blei- und Silberhütte von Příbram/ČR. Aufschluss 47, 267-287 (in German). 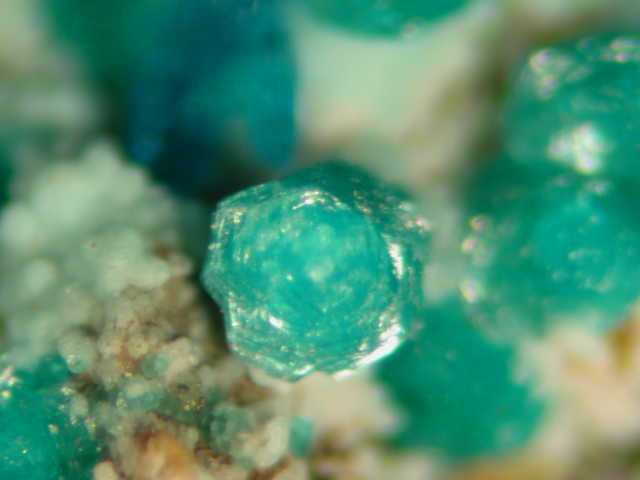 GRAF, H.-W. (1992): Mineralien der Nordeifel (2).- Mineralien-Welt, 3, H. 3, p. 28. Schnorrer-Köhler, G. & David, W. (1991): Die Blei- und Silberhütte Braubach und ihre Haldenminerale. Lapis, 16 (1), 38-49; 58 (in German). Schnorrer-Köhler, G., Rewitzer, C., Standfuss, L. & Standfuss, K. (1988): Weitere Neufunde aus Lavrions antiken Schlacken. Lapis 13 (2), 11-14.
ko.jansen; Laurion tHE MINERALS IN THE ANCIENT SLAGS BY PIET GELAUDE ETC. Bonotti, F., Nannoni, R. (2012): Le scorie antiche della Toscana centrale. Riv. Mineral. Ital., 36, 3 (3-2012), 186-94. C. Lemanski, Jr. collection (6787CL). ⓘ Konnerudkollen Mines (Konnerud Mines) ? ⓘ Glomsrudkollen Zinc Mines ? ⓘ Remšnik mine (Remschnigg; Remshnig; Drauwald) ? Trajanova, M. & Zorz, Z. (2013): The abandoned Remshnig mine, occurrence of rare minerals; Palaeozoic or Tertiary ore mineralization? Berichte Geol. B.-A., 99, 11th Workshop on Alpine Geological Studies & 7th IFAA, 90-91.
ⓘ Raiks Vein (incl. Broadlaw Low Level) ? Mineralogical Magazine 1982 46 : 51-54.